Chagdud Gonpa Amrita is a Buddhist meditation center located in Edmonds, WA. Every Wednesday from 7:30PM to 9:00PM we have an Open Practice session and anyone who is interested may join us. No previous meditation experience or particular spiritual affiliation is necessary. The traditional Buddhist practices we do are translated into English and found in our prayer book, Precious Echoes–Recitations for Awakening the Mind, copies of which are available at the center. Each week a senior Amrita member acts as a chant leader and timekeeper. Cushions or chairs are available for everyone and shoes are left outside the shrine room. We often listen to podcasts of short teachings by the teachers of Chagdud Gonpa on Wednesday night. Lama Padma regularly visits us and offers Dharma talks when he is not in California at Rigdzin Ling, our main Dharma Center in North America. From time to time we host other Lamas who are teachers in accord with our lineage. Our members are happy to meet and visit with those interested in learning more about these meditation practices and our other activities. There is no fee for attending our open practice. The most profound Buddhist teachings on the absolute nature of wisdom are found in the numerous texts collectively called the Prajna Paramita Sutras. 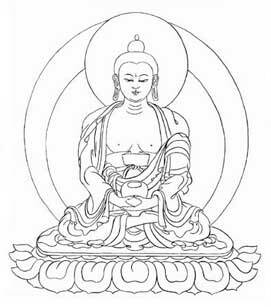 This is the most condensed of these texts and contains the very essence, the heart, of all the wisdom teaching of Buddha. It is taught that to recite and contemplate this text brings us face to face with this wisdom within our own mind. We follow this recitation with a short period of quiet contemplation. We are a meditation center whose practices are rooted in the Vajrayana tradition of Himalayan Buddhism. The founder of Amrita was Chagdud Tulku Rinpoche, a great meditation master from Tibet. He gave us the practice of Red Tara, which he considered to be particularly appropriate for these times and this place. 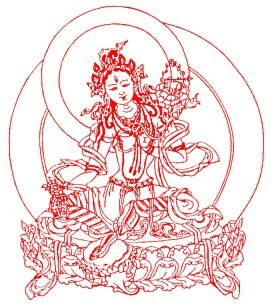 Red Tara is the expression of an active, powerful compassion that is inseparable from great wisdom awareness. 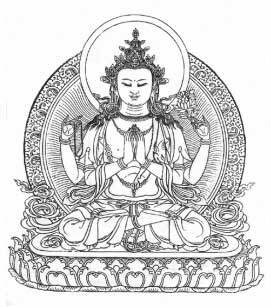 We conclude with the practice of Chenrezig, the bodhisattva of compassion that is the pure manifestation of one’s own nature, an easy to practice meditation that includes recitation of the mantra OM MANI PADME HUNG. By connecting in this way to an expression of enlightened mind, one’s love and compassion become unbiased and all pervasive.